On Sunday night in St. Petersburg, the final prize giving was an opportunity to remember and celebrate all that has happened on this magnificent adventure. It was an emotional evening, with all of the teams, their families and friends finally able to truly relax after living in the pressure-cooker of the past nine months. It was also time to say goodbye, with most of the teams disbanding as early as Monday, airplane tickets taking them to all corners of the globe already in hand, booked months in advance. The most poignant moment came with the inaugaral awarding of the Hans Horrevoets Rookie Trophy, which was created in memory of Hans, who was lost at sea during the last edition of the race. The Dutchman was washed over the side of ABN AMRO TWO on the transatlantic leg. He had played a key role in ABN AMRO's unique and ambitious project to help young talent break into the top level of offshore sailing. His wife, Petra, was on hand to present the award and her emotional speech saw even the most hardened of sailors wiping tears from their eyes. The award was created to recognize a rookie sailor who was younger than 30 when the event commenced. Each skipper was asked to nominate a who has shown a significant drive to make an improvement to their own skills and to the skills of the team and who has shown a significant contribution in strengthening the team onboard. The Race Committee made a selection from those nominated. 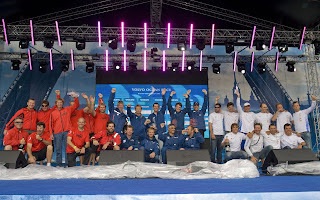 The winner of the inaugural Hans Horrevoets Rookie Trophy is Michi Mueller from PUMA Ocean Racing, whom skipper Ken Read said had grown from a raw, untested rookie, into a linch-pin of the team. It was a good night for PUMA as the Inmarsat Media Prize went to Rick Deppe, who was recognised for his outstanding work across the entire race. Deppe won the prize for leg 10 (his fourth win), as well as the overall prize (which included a cheque for 10,000 euros), and he was quick to pay tribute to his colleagues, asking all of the media crew members to join him on stage. 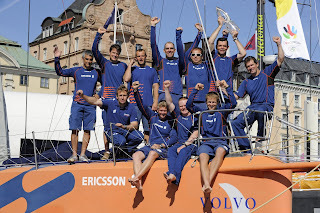 The Wallenius Wilhelmsen Logistics Seamanship Award was given to the PUMA Ocean Racing shore crew (Neil Cox, Sean Healey, Will Oxley and Kimo Worthington) for rending assistance to Telefonica Blue, after they ran aground at the start of Leg 9 in Marstrand.